A mirror is literally interpreted as a pure reflection of reality but what if this could not only enhance the qualities of a space yet reveal another dimension? Would you dare to through yourself in? I know I would. Looking for elements of dimensional stimulation immediately Anish Kapoor sculptures come into mind; so generous, so wide, so deep, so simple yet magnificent. Contemplating so I wonder how to translate that into an interior space, to widen the horizons of living. Designs that through various techniques transform the reflection with colour. Broken sculptures that let reflection interact with the light whilst creating a multiple dimension of movement in each reflection & the collective. At last but not least reflective materials that stretched give a deeper view into a deformed reality. In all three categories it is brilliant how different approaches to the same surface will influence its force. Weather they are designs approached in an arty manner & art proposed as interior design elements the effect caused is what motivates me. 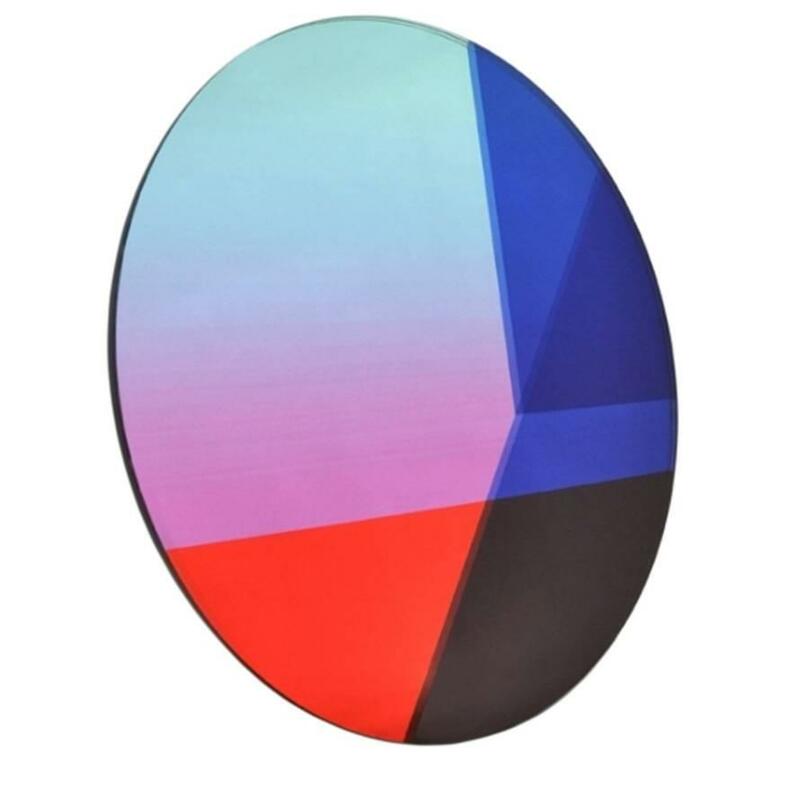 So we start with this fabulous selection of exciting contemporary mirrors, all of which are chosen for transforming the identity of the mirror by using colour & interesting techniques that trigger the outcome of we are looking for. Oxidized silver layers in David Derksen & Lex Pott’s work create geometrically shaped optical illusions & due to its natural process this mirror continuous oxidising, being then almost alive. The way the ‘Transience’ mirror wraps the personality of this Hoxton Amsterdam room is a great example to a charming transformation. Tjimkje de Boer has chosen a magic colour palette too but in this case it somehow feels like you are drowning in the mirror, a float like sensation as the colours seem to fuse in slow motion. A truly enchanting dream like piece as powerful as Derksen & Pott’s mirror but with an organic fluidity that captivates me. 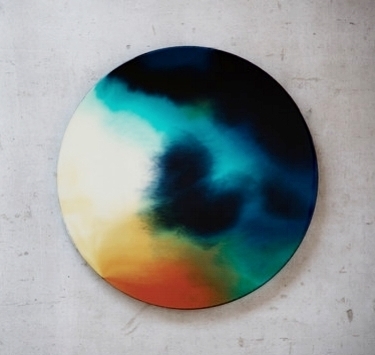 Another fabulous geometrical piece is ‘Big round’ by Brit van Nerven & Sabine Marcelis. Mirror consequence of a sensational project where mirror has been pushed to the limits by using all sorts of techniques such as sandblasting, UV gluing, laminating, layering, & playing with colour overlays. The result is magnificent & totally relevant to bring that colourful depth to any interior. Finally I propose an even more playful mirror (by this I mean perhaps younger). Patricia Urquiola has created ‘Shimmer’ a true shinning like rainbow. Degrading shades & that multichromatic finish gives that subtle but powerful colour shades around the edges making it catch light in various ways giving a glitter like effect to the experience. Hence the playfulness as the interaction most suits the character of the person. Never the less a most in this category. Fragmented reflective surfaces that echo several images of the same self in different manner are the core of this category & how best to start than with Mathias Kiss well recognised piece. The technique of this sculpture including its edginess has made it an icon of great interior decoration. I like the impression of static broken movement expressed & how each angle catches different light & distorts the image reflecting that creates an unusual movement. Similar effect in a complete different manner happens on this commissioned work in a flatter yet 3Dimensional tradition, in fact it shows clearly that ‘ensembliers decorateurs’ craft of the French 30’s-40’s. In either way both mirrors delivering as expected. If there is someone I admire in his various design facets is Vincenzo De Cotiis, in this particular case I am physically melting for this sculpture. It is striking & made entirely under his reclaimed mentality, his abstract thinking & his ‘deconstruction, reconstruction & re-appropriation’ attitude. All of which makes D1612 a true wonder piece, being as rough & raw like him. Yet acting more subtly in a room still wearing all his strength of its sleeve. It would be the eye catcher of every interior. 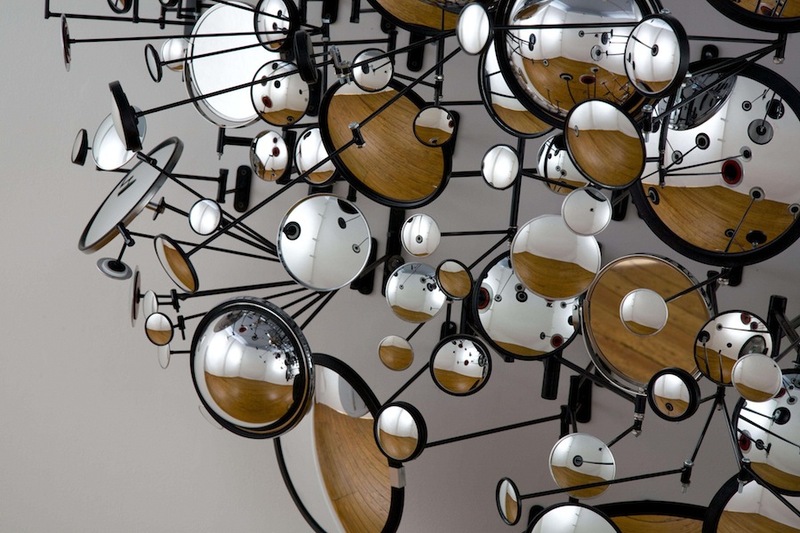 Graham Caldwell has also explored multi-pieces sculptures that can create interaction with the viewer & perhaps set up various eyes into a further dimension, inside the mirrors bounce a multiplied extended deformed space into the room in which it is placed. A similar effect may be at the master bedroom’s entryway by Simon at Jacobsen Architecture in the Nantucket project. Makes me think that alike Anish Kapoor there is an inclination to a broken distortion of the being. Finally a small selection of interiors where the ‘maestro’ of illusion acclaimed Anish Kapoor delivers a polished threshold between the person in the room & the seeming reality. Perhaps this is the reason why Robert Migotto has chosen ‘Fractured Mirror’ as the beginning of a journey on a tuned classic Parisian apartment with a great twist. He has combined classic pieces with warm neutrals & brushstrokes of colours in the works of contemporary art including Kapoor’s piece, which tricks the eye. Migotto’s clash style blend probes that stretching interior design boundaries brings depth to the space & the way it is perceived. In the opposite side of the spectrum we have Film Director Michael Bay’s LA home, which presents generous architectural proportions & extensive interiors, where designer Lorraine Letendre has explored a minimal approach with a mixture of vintage pieces by Le Corbusier & Pierre Jeanneret, bespoke crafted pieces & a curated assortment of art. Amongst this selection is a Kapoor’s Mirror placed as the heart of the glorious abundant living room, art piece that stretches the magnificent views by reflecting nature’s grandeur seen through the massive window wall. From nature to history, heritage of the family ruling de capital of design for almost 200 years. Visconti’s apartment a few steps from the Duomo di Milano is the example of design legacy. Jewellery Designer Ossana Visconti inhabits these original frescoed ceilings & wall in company of her family. The interiors are bursting with rich culture & Italian tradition combined with her personal collection of modern art & furniture complemented with key pieces from prominent Italian designers of the 1950s & 60s. Resulting in an opulent space that is deformed by the Kapoor’s mirror, which exceptionally spills the frescoes to the floor, rather sensational. Time to go back to colour, here are some projects in which we can observe endless magic given by Kapoor’s mirror. Parisian Architect Joseph Dirand lights up successfully this dinning room with an emerald green to die for in this very contemporary London apartment, also at Actress Laura Santos’ home in Manhattan the landing becomes as softness with powerful coloured pieces that bring another layer to the interior. At last we find a ‘golden medal’ popping out of this fabulous Shagreen Art wall covering, the brightest interaction yet with this overextended interior reflection of a new dimension, acute choices by Interior Designer Juan Montoya in NYC gallery-like home. 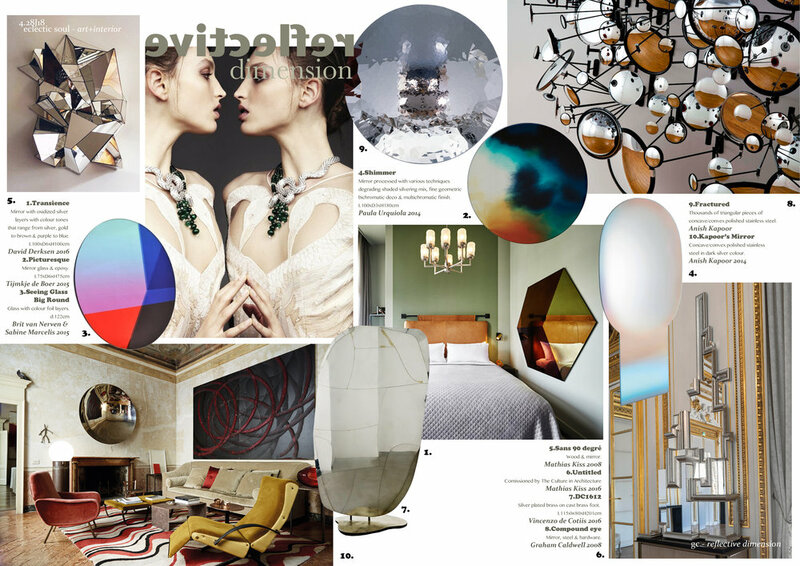 CASA VOGUE: Brasil edition issue #351 January 2014 Interior design by Roberto Migotto/ Fractured mirror: art piece by Anish Kapoor.